Oxford Products has just announced a new scheme where you can swap your old bike luggage for soft Oxford Lifetime Luggage. 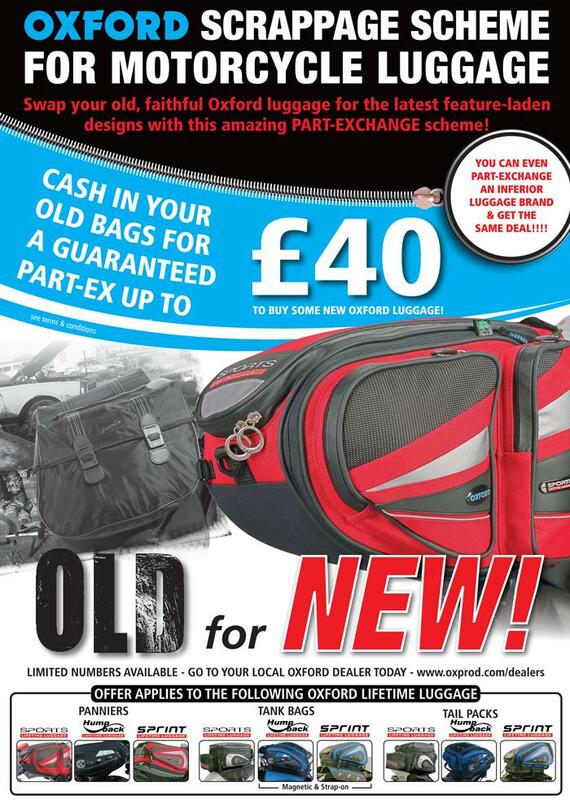 This offer enables bikers to part-exchange their old soft motorcycle luggage (any make) for new Oxford Lifetime Luggage and receive a guaranteed value for their old gear of up to £40. One old piece of motorcycle luggage may be part-exchanged at a participating dealership for one new piece of Oxford Lifetime Luggage – without exception, this is a one for one offer. Any individual may part-exchange up to three items of luggage, so they could end up with a full set (panniers, tank bag and tail pack). Motorcycle luggage being exchanged for a new set of Oxford panniers will be entitled to a £40 part-ex value; that being exchanged for a tank bag or a tail pack £35. These values will be deducted from the full 2009 RRP of the Oxford luggage items. Full details are available at www.oxprod.com. This promotion is funded by Oxford Products Ltd and it's a win-win for everyone. The old luggage items will subsequently be collected from the dealership by an Oxford representative and a replacement for the item purchased in exchange supplied to the dealership at a subsidised cost. Unless otherwise notified, this offer runs until 31/07/09 but is limited by availability of stock.